Updated Thursday January 5, 2017 by BWSP. 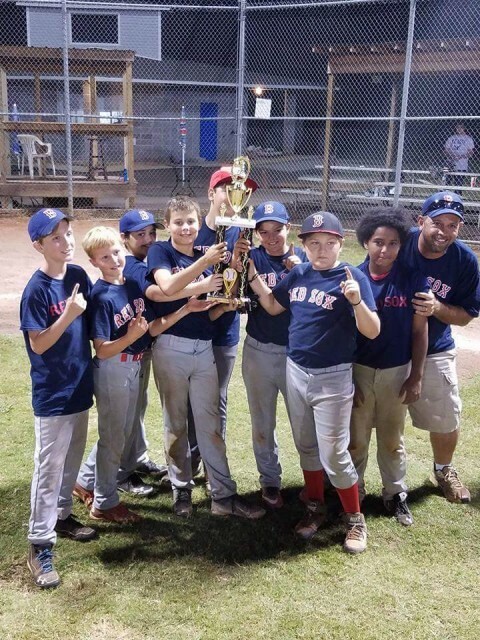 Our 12u Red Sox baseball team had to battle a tough Meridianville squad last night and came away with the victory 2-1 in a pitching duel between the 2 teams. It was a close game from the start with both stingy defense not relenting much on the diamond. A steal at home on a passed ball would give the Red Sox the lead 2-1 in the 4th inning which Meridianville wouldnt be able to overcome. Cavan Alexander and Janson King would take home co-MVPs for their pitching and play in the field. Coaches Corey Alexander and Mike Sims were impressed that the kids were able to face so much adversity throughout the tournament and still finish each game. The Red Sox finished undefeated at 11-0 for the season and came home with the hardware.